An impressive centre situated in an idyllic part of the Malaga beach-front. Offices are available on flexible terms at affordable prices. Here, take advantage of the spacious meeting rooms, high-speed internet and professional reception desk. The local area is filled with local restaurants, stylish bars and idyllic surroundings. Transport links are numerous and allow tenants to access the city and rest of country with ease through road, rail and bus links. The Malaga Airport is also a short 20 minute drive away, further increasing the global potential of your developing business. The business centre is situated just off the MA-20, so it is highly commutable and in close proximity to an abundance of local mundane amenities. Here, there are lots of fantastic facilities to help enhance your business, such as meeting rooms, support services, 24-hour access, furnished turnkey solutions and conference rooms. It is located right in the heart of Malaga for high connectivity and convenience. 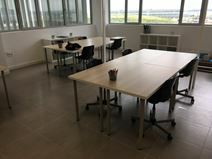 An impressive co-working centre situated in Malaga providing an array of furnished office-spaces available on flexible terms. Work-spaces here benefit from high-speed internet, meeting rooms, maintenance and reception services. The building is also accessible 24-hours a day. Moreover, the office-spaces are proximate to several major transport connections, providing convenient travel around the area. Local amenities surround the building as well, with several restaurants, schools, parks and retailers. This centre is well situated in central Malaga in close proximity to a wide range of local amenities including restaurants, bars, hotels and retail outlets. The Airport is nearby as well, allowing for travelling clients and employees to navigate easily. Here, there are plenty of options available including private offices or virtual offices, whilst being supported by an extremely friendly on-site administrative support team. Other amenities include; 24-hour access, air-conditioning, equipped meeting rooms, all complete with great levels of natural light throughout the day. This relatively new centre is located in the main business area of Malaga close to the fair and conference hall and Malaga's new courthouse. The area is well serviced with numerous restaurants, cafés and banks. Office spaces are fully furnished and equipped to create a professional working environment for immediate use. This centre is fully configurable to accommodate a range of business requirements. A beautiful centre situated in central Málaga, with access to plenty of useful services to help your business develop. The offices are available on flexible terms and maintain great levels of natural light during the working day. Professional amenities include high-speed internet, reception desk, meeting rooms and a cleaning service for communal areas. The local area is well connected through public transport, whilst the airport is a short 15-minute drive away. Local amenities surround the centre including a wide range of local bars, restaurants, hotels and supermarkets. Here, there is something for everyone to enjoy in such a vibrant area. A modern co-working space situated in a vibrant area of Malaga, providing a range of furnished office-spaces available to let on flexible terms. All work-spaces benefit from plenty of natural light throughout the day as well. Tenants here can make use of the high-speed internet, meeting rooms, reception desk and 24-hour access. In addition, the area is filled with local amenities as well as convenient transport links providing useful travel around the city itself and surrounding areas. These highly representative office spaces are fully furnished and can be configured to meet individual requirements. The offices are equipped with modern technology allowing clients to start work as soon as they wish. Located in Malaga's port, which is home to a multitude of official departments and associations, the centre profits from being close to some of the city's best restaurants, bars and shops. A brand new business centre is due to open in December in Malaga. Modernly furnished and decorated with great attention to details, this centre offers a highly professional and efficient working environment. Located in proximity of the Technology district, which hosts numerous businesses, this centre enjoys an excellent location in Malaga, which is rapidly growing to become an important commercial centre.